Hey, there. If you’d like a printable list of Gwyn Cready’s books, click here. Just in Time for a Highlander is the first book in Gwyn Cready’s Sirens of the Scottish Borderlands series. (First Time with a Highlander is the second. The third, Every Time with a Highlander, will be available August, 2016.) 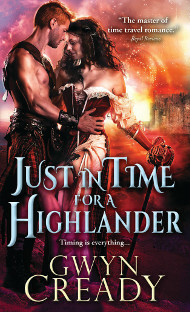 You can read the first chapter of Just in Time with a Highlander here, or order it through one of these fine booksellers: Indie Bound. Amazon. B&N. BAM. iBooks. Google Play.